Important Islamic Manners: Society creates, develops and nourishes on the bases of some specific norms. Every society, tribe or family has some cultural balances and norms. Likewise every religion has its norms or manners and some general rules to set your lives and to build a healthy and peaceful society. If we look at Christianity, they visit their church every Sunday. Sunday is for their God. In Hinduism, they feed their God with milk. These religions set the rules of making family or getting married etc. Islam is the religion of everyone and it covers each and every field of life. Islam is not only related to Muslims but for everyone. If we talk about Islamic manners, there are almost one million rules or teachings that Allah Almighty sent towards his men. Islamic manners have been practically demonstrated to us by our Prophet Muhammad (PBUH) and have been recorded by many Hadith’s and by Holy Quran. Importance of Islamic manners can be seen in the daily of Muslims. Let’s start with the greetings, in the religion Islam Allah Almighty emphasize on saying Assalam o Alaikum which means “Peace be upon you�?. 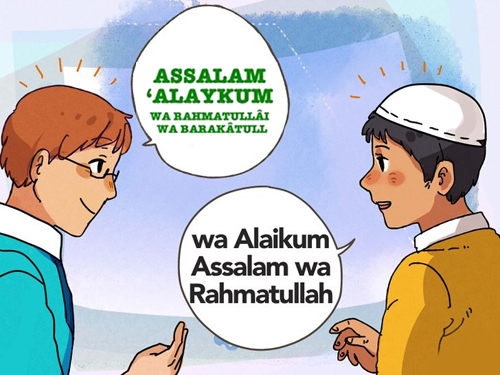 That means, one is starting his conversation with blessings of Allah. What about when you go to visit someone, it is stated by Prophet Muhammad (PBUH), “knock at the door if no one opens knock again but knock three times if you found no reply, return to your place.�? In the Holy Book of Quran it is stated that “if you look in someone house and disturb his privacy and he hit your eye with a stone, there is no blame on him.�? Now what are the eating manners in Islam? ‘To eat at a table is to make eating easier and there is nothing against that.’ Do not start eating ahead of the elders or the nobles. If you are the elder, do not commence eating before everyone is at the table. Eat slowly, and chew proper so it will be easy for digestion. Islam highly emphasize on hosting or doing proper hospitality. Prophet Muhammad (PBUH) serves all the things present in home to his guests. All of this clearly shows the importance of Islamic manners. Islam is a complete religion for mankind.